Docker for Windows was introduced recently. Docker for Windows runs Docker containers on Windows OS similar to running Docker containers on Linux platforms. The novelty of Docker for Windows is Docker Windows containers. Docker Windows containers differ from Docker Linux containers in that they run on Windows OS. The essential concept is the same – Docker containers running in isolation on an underlying OS with each having its own networking and filesystem. Windows is the most commonly used desktop OS and Docker for Windows has made it feasible to run Docker on Windows. In this tutorial we shall introduce running Windows containers with Docker for Windows. We shall also introduce running some of the commonly used databases in Docker Windows containers. This tutorial has the following sections. 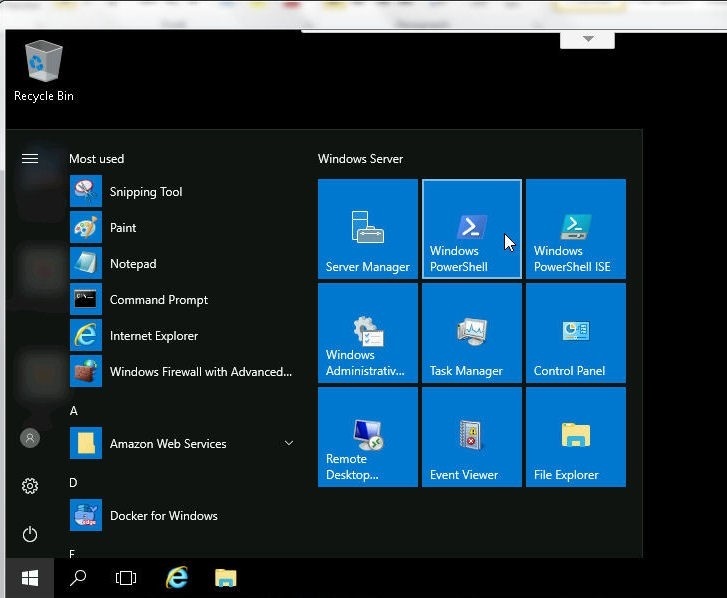 Docker for Windows supports Windows 10 and Windows Server 2016. Create an instance on a local machine or on an AWS EC2 instance running Windows 10 or Windows Server 2016 OS. We have used a Windows Server 2016 instance running on AWS EC2. Launch a Windows Server 2016 instance on EC2 with Microsoft Windows Server 2016 with SQL Server 2016 Express AMI as shown in Figure 1. The required connection parameters, which would be different for different users, may be obtained with Connect, as shown in Figure 2. Find the password in the Connect To Your Instance wizard. 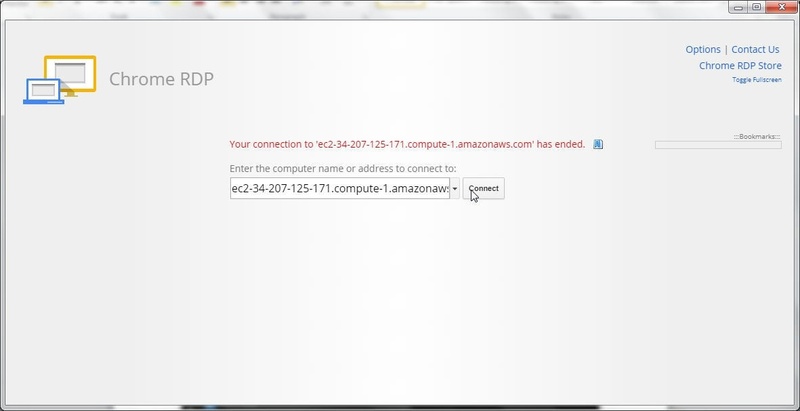 Copy the following information, which is required to connect to the Windows Server 2016 instance on EC2 using remote desktop client such as Chrome RDS. Subsequently connect to the Windows Server 2016 instance from a local machine using Chrome RDS. Install Docker for Windows (Stable or Edge edition) from https://docs.docker.com/docker-for-windows/install/. The Edge edition is used in this tutorial, as shown in Figure 3. By default, when Docker for Windows is started one of the modes is configured: Linux containers or Windows containers. 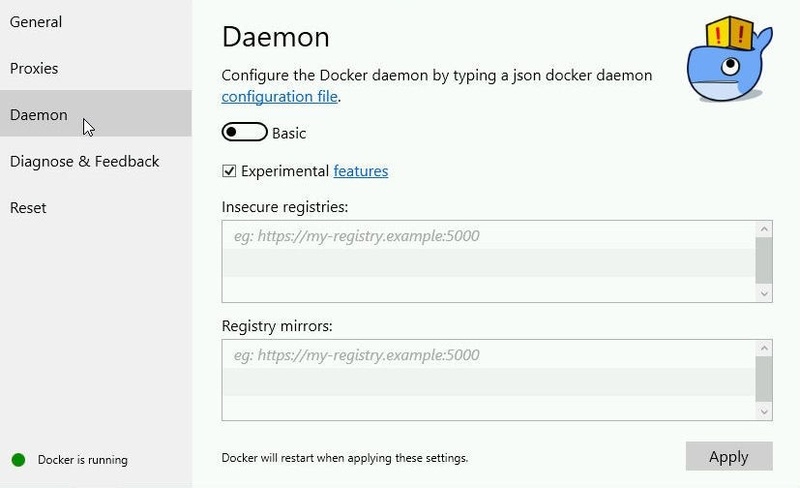 To find which mode is preset click on the ^ button and right-click on the Docker icon. 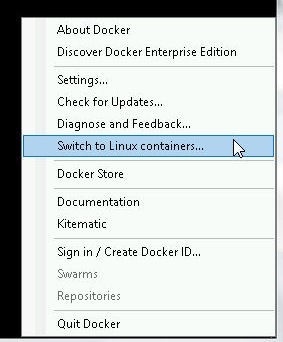 If the Linux containers mode is preset the option to switch to the Windows containers mode is listed. as shown in Figure 4. Click on Switch to Windows containers… as shown in Figure 4. The message Docker is switching… gets displayed, as shown in Figure 5. The dialog “Containers feature is not enabled” gets displayed, as shown in Figure 6. To enable the Containers feature click on OK. As indicated in the dialog the machine restarts after the mode is switched to Windows. 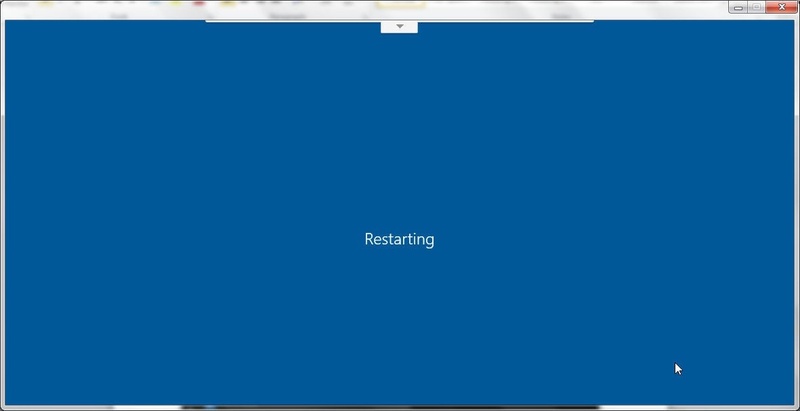 The Windows machine restarts, as shown in Figure 7. The Connect wizard for the remote desktop client (Chrome RDP or another) gets restarted. Select the Public DNS of the Windows Server 2016 machine and click on Connect as shown in Figure 8. After the Windows Server 2016 is relaunched the message “Docker is running” gets displayed, as shown in Figure 9. How to verify the mode has been switched to Windows containers? In the same dropdown in which the containers mode was switched to Windows, the option Switch to Linux containers… should get displayed, as shown in Figure 10. Docker for Windows is designed to be used with Windows PowerShell, which is a task automation and configuration management framework consisting of a command-line shell that runs a scripting language based on .NET Framework and .NET Core. To launch Windows PowerShell select Windows PowerShell from the Windows applications as shown in Figure 11. The Windows PowerShell command-line shell gets started, as shown in Figure 12. The docker commands may be run in the Windows PowerShell to build images, run containers and run Docker services. The docker version command lists the Docker version, as shown in Figure 13. By default Docker for Windows (Stable and Edge) is set to Experimental mode as indicated by the “Experimental” attribute. Experimental mode is only for a development environment and not suitable for Production. The Experimental features checkbox may be deselected in Settings>Daemon as shown in Figure 14. Docker Windows containers may be run using the docker run command, similar to running Docker Linux containers with one essential difference. The Windows containers run on Windows OS and the Docker images for Windows containers have to be based on a Windows OS. In terms of Dockerfile for a Docker image that may be used to run Windows containers, the FROM instruction in the Dockerfile must be for a Windows OS. This implies that the Docker images that are used to run Docker containers on a Linux platform and are familiar to most Docker users cannot be used to run Windows containers. Several Docker images, such as microsoft/nanoserver and microsoft/windowsservercore, which are based on Windows OS are available on Docker hub. As an example, run a Docker Windows container with the microsoft/nanoserver Docker image. The Docker image microsoft/nanoserver may be pulled with a docker pull command as shown in Figure 15. Subsequently list the Docker image with the docker images command. Run a Windows container with the Docker image microsoft/nanoserver using the docker run command. A Windows container gets created. Subsequently list all containers (running and exited) and the Windows container should be listed. The Windows container has exited after running the “hostname” command. As an another example of running Docker Windows containers, run a Windows container with the hello-world image, which provides an image for both Linux and Windows platforms. As shown in Figure 16, a Docker container gets started with the hello-world image. The output from the docker run hello-world command lists a docker run command to run a Windows Server container. Run the preceding command and a new PowerShell command shell gets started, as shown in Figure 17. The Windows container for the Windows Server has its own filesystem and networking. 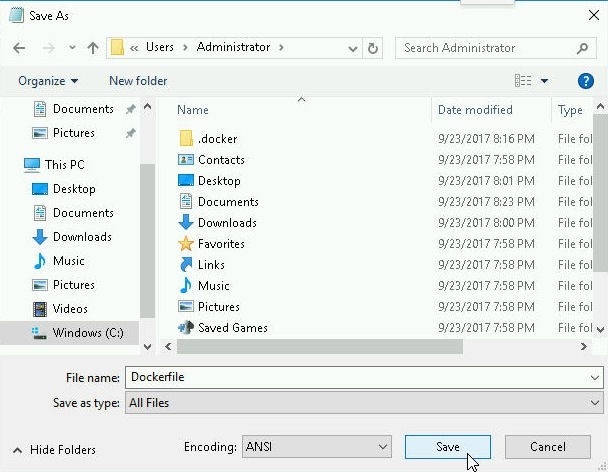 As shown in Figure 18, the files and directories in the Windows container may be listed with the dir command. To exit the PowerShell for the Windows Server Windows container, specify exit and the command prompt returns to the Windows PowerShell session from which the Windows container for Windows Server was started, as shown in Figure 19. In the preceding section we ran a Windows container with the microsoft/nanoserver Docker image. In this section we shall use the microsoft/nanoserver Docker image as the base image to create a new test image for Windows containers. A new Docker image for Windows containers may be created using a Dockerfile (as discussed in a later section) or by specifying the Dockerfile instructions on the command line. As an example, create a Docker image called dvohra/windows-test-image for Windows containers with the base image microsoft/nanoserver. The new Docker image dvohra/windows-test-image includes a CMD to output a “Hello World” message. 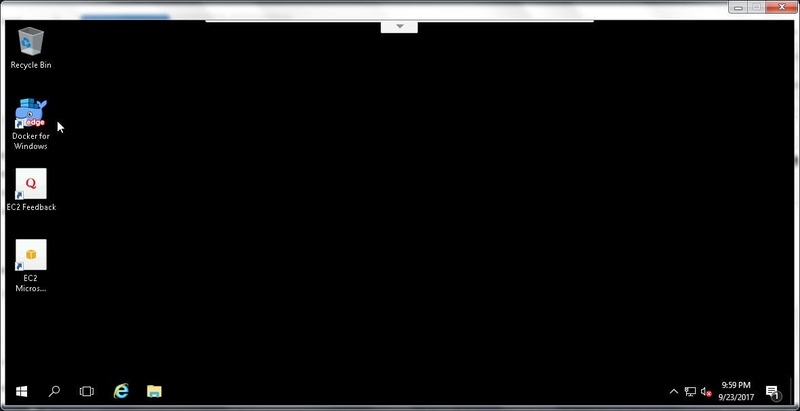 Step 2/2 : CMD echo Hello World! A Docker image called dvohra/windows-test-image:latest gets created and gets listed with the docker images command. Next, run a Docker container with the Docker image dvohra/windows-test-image:latest. A “Hello World!” message gets output. Having built a Docker image for Windows container, the image may be uploaded to the Docker Hub if a Docker Hub account is created for a user. First run the docker login command to login to the Docker Hub. Specify the password at the Password prompt. Upload the Docker image dvohra/windows-test-image with the docker push command. The Docker image for Windows containers dvohra/windows-test-image gets uploaded to the Docker hub as shown in Figure 20. The Docker image may be tagged differently by different users as Docker image dvohra/windows-test-image won’t get uploaded to different user accounts on Docker hub. The tags for the Docker image dvohra/windows-test-image list a single tag “latest” as shown in Figure 21. In the preceding sections we used the docker run command to run Docker Windows containers with Docker images based on Windows OS. The Docker Swarm mode may be set in Docker for Windows to create Docker services. First, create a Docker Swarm with the docker swarm init command using the Private IP Address of the host Windows Server 2016 instance, which may be obtained from the EC2 management console as already shown in Figure 1. The Private IP address is listed with the Private IPs label. Swarm initialized: current node (nytx2hvq53vez1eywslwsar6e) is now a manager. The Swarm mode gets set and the current node becomes the Swarm manager. The docker swarm join command to join worker nodes to the Swarm also gets output. The preceding command, as the earlier commands, is to be run in the PowerShell as shown in Figure 22. After the Swarm mode has been set Docker services may be created using the docker service create command. As an example, create a Docker service using the Docker image dvohra/windows-test-image that was created earlier. The following command creates a Docker service called hello-world consisting of one replica. The docker service create command outputs the Docker container ID. List the Docker services with the docker service ls command, and the hello-world command should get listed. As the Docker Windows container exits after outputting the Hello World! Message, a new Docker Windows container gets started to keep the replication level at 1. The REPLICAS column may list the number of running replicas as 0 if a Windows container has just exited and a new Windows container has not yet been started. Or, the REPLICAS column lists replicas as 1/1 if the service replica is running when the docker service ls command is run. The docker ps –a command lists both running and exited Windows containers and multiple containers for the Docker service get listed as Windows containers keep running and keep getting exited and new Windows containers keep getting started. To list the logs for a Docker Windows container run the docker run <container id> command. The Hello World! message gets listed, as shown in Figure 23. The docker service command may be used for other service management such as listing service tasks, scaling a service, updating a service, rolling back a service update, and removing a service, as shown in the docker service command usage in Figure 24. The Docker image dvohra/windows-test-image:latest for Windows containers was created by running Dockerfile instructions on the PowerShell command line. A Dockerfile is more commonly used to create a Docker image than for running instructions on the command line. Next, we shall create a Dockerfile for a Docker image for Windows containers. A Dockerfile does not include a file extension and may be created with the notepad command. 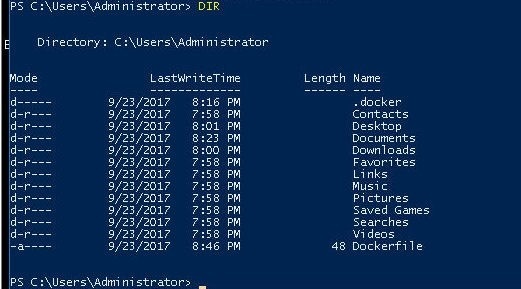 The notepad command to create a Docker file is run in PowerShell, as shown in Figure 25. The command is shown to have returned in Figure 25, but the command returns only after a Dockerfile has opened in a notepad and the Dockerfile saved with File>Save As. A Notepad gets started, as shown in Figure 26, and a dialog prompts the user that the Dockerfile cannot be found and is the Dockerfile to be created. The file name indicated is actually “Dockerfile .”, but it is only to avoid adding a file extension to Dockerfile. We shall add the Dockerfile instructions and save the file as Dockerfile. Copy the following Dockerfile instructions (or some other instructions) to the Dockerfile. The requirement for a Dockerfile for a Docker image for Windows containers is that the FROM instruction should be for a Windows server. The Dockerfile is shown in Figure 27. Select File>Save As.. as shown in Figure 28. Save the Dockerfile to the C:/Users/Administrator directory as shown in Figure 29. 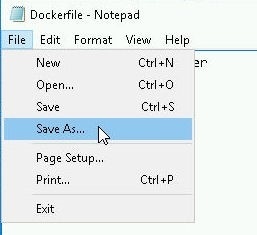 After saving the Dockerfile select File>Exit to exit Notepad. The DIR command should list the Dockerfile, as shown in Figure 30. A Dockerfile is a template for a Docker image. To create a Docker image from the Dockerfile in PowerShell, run the following command, in which the Docker image is tagged as dvohra/hello-world. The Docker image may be tagged differently by different users. A Docker image gets built. 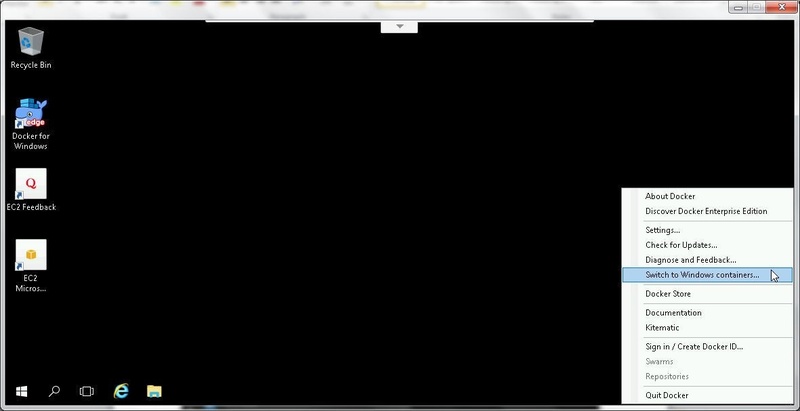 Step 2/3 : CMD echo Hello World! Listing the Docker images should include the dvohra/hello-world Docker image. A tag for the Docker image must be specified, as without one, a Docker image with no repository and no image tag gets built, as indicated by the docker images command issued subsequent to creating a Docker image without a tag. We shall discuss in a later section how a dangling Docker image with repository and tag as <none> may be removed. But first, we shall run the Docker image dvohra/hello-world in the next section. The Docker image dvohra/hello-world may be used to create a Docker service with the docker service create command, or a standalone Docker container may be created with the docker run command. Create a standalone Docker Windows container called hello-world with the 8080 port exposed on the host. The Docker container runs and outputs the Hello World! message. If a Docker container by the same name hello-world was created previously it must be removed, as two Windows containers by the same name cannot be created. The Docker Windows container exits after running, as indicated by the docker ps –a command. Docker Windows container are relatively new and Docker images for Windows containers are not available for all of the same databases as for Docker Linux containers. But, new Docker images for Windows containers are being added to Docker Hub as their use becomes more common. Prebuilt Docker images for Windows containers are available for several commonly used databases. For example, Docker image microsoft/mssql-server-windows-express may be used for SQL Server Express. Create a Docker Windows container for SQL Server Express with the docker run command. Subsequently, list the Docker Windows container with the docker ps command. Some of the Docker images already available on Docker Hub, such as the mongo image for Mongo database, have new tags available for Windows containers. The mongo:3.0.15-windowsservercore image may be used to run a Docker Windows container for Mongo database. Create a Docker Windows container for Mongo database with the docker run command. Subsequently a Windows container for Mongo database gets listed with docker ps command. A Docker image may be removed only after all the Docker containers that make use of the Docker image have been removed. Remove all Docker Windows containers on PowerShell with the following command. All Docker Windows containers get removed. As a replicated Docker service must keep its defined replication level, a new Docker Windows container gets started for the hello-world service based on the Docker image dvohra/windows-test-image. A Docker service is removed with the docker service rm command. Earlier we discussed how a Docker image with a <none> tag, also called a dangling Docker image, could get created if a Docker image is not properly tagged when built. Dangling images may be removed with the following docker rmi command. Docker images that are built as required; Docker images that are not dangling images, may be removed with just the docker rmi command after all Docker containers and services for the image have been removed. Docker for Windows has introduced Docker to the Windows OS users. Docker for Windows supports both Docker Windows containers and Docker Linux containers. We have discussed only the Windows containers in this article. By default Docker for Windows has the Experimental features mode set, but the Experimental features may be turned off in settings if used in production environment. Docker for Windows is relatively new and Docker images for Windows containers may not be available for all of the commonly used databases, but new Docker images are added to Docker Hub as Windows containers use becomes more common. Several of the Docker images for databases already available on Docker Hub are adding tags for Windows containers.